Outdoor Adventures: Acadia National Park, by Jerry and Marcy Monkman, 2017. 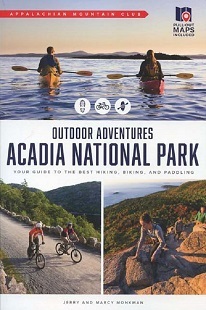 Newly revised edition of well-written AMC guide (formerly titles Discover Acadia NP) describes the best 50 hiking, biking, paddling and sea-kayaking trips at Acadia. In addition to the thorough trip narratives, an appendix provides traditional guidebook descriptions for all official park hiking trails. Includes a color trail map (paper, 100-foot contours) showing entire park on one side and detail map of eastern section of park on reverse. 298 pp, 6" X 9".